So Fashionably Frugal: Shopping Picks & Favorites for July! Hey guys! 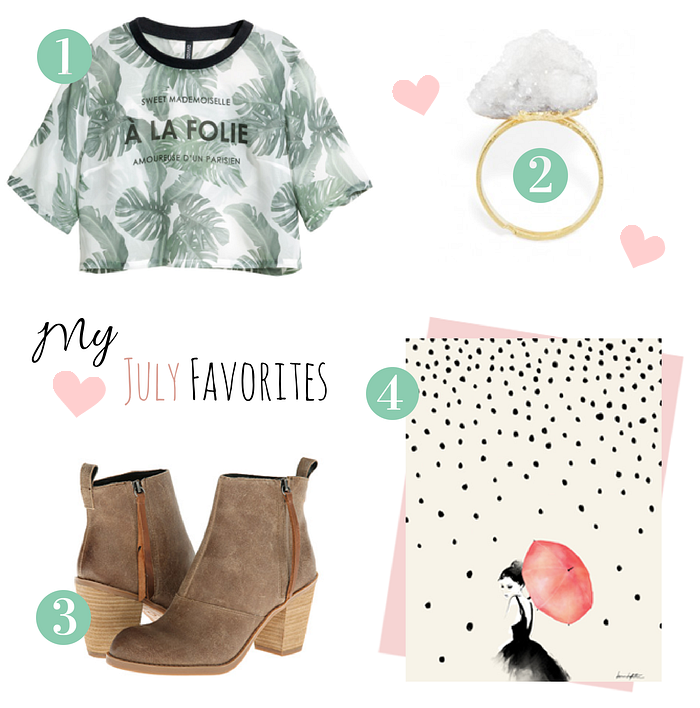 Today I will be sharing with you my favorite shopping picks for July. Why? I've seen a few posts like this around the blogging community and I think it's really fun! You basically post about all the things you've been drooling over at stores for the month. Talking about drooling...my boyfriend took me to Chili's last night and I had my very first lava cake. They are amazing!! Have any of you guys tried one? It was like a little masterpiece too...it looked just like a volcano. The kid in me was pretty happy about that ;) But anyway, back to my favorites! 1) H&M - $17.95 : This top looks high fashion and has French written on it. Sold! 2) BaubleBar - $28 : I dunno about you guys but I've loved geodes since I was kid. Most geode rings are pretty stingy...as in a really small, flat geode. This is one of the best ones I've seen so far. It's definitely a statement piece too which is a plus! 3) DV by Dolce Vita Joust - $49.97 : I'm really into the style of Clarks shoes minus the price. These ankle boots are very similar to the materials and colors used in their desert boot and the cost can't be beat. 4) 'Polka Rain', Society 6 - $35 : I'm a big fan of fashion prints, and this one by Karen Hofstetter is one of my favorites. It reminds me of one of my favorite people too....Audrey Hepburn! The smallest size it's available in is an 8x10. I think it's a great piece to keep at your desktop or above your vanity. 5) Maybelline Nudes Palette, Ulta - $10 : This palette recently came out and it's well worth the ten bucks in my opinion! It includes a great mix of matte and shiny eyeshadows that are perfect for day and night looks. The colors go great with my skin-tone and the back of the case explains multiple ways to apply it. 6) Harvey Prince Hello Body Cream , Birchbox - $22 : I got this lotion in my latest Birchbox and it smells so delicious I can't get over it. If you love citrus scents then this is for you. I'll definitely be purchasing it in the future! 7) OPI Nail Polish in Gargantuan Green Grape, Target : This is one of my favorite nail polishes for Spring. The pale green doesn't look minty or like puke (which I hate!). The color also makes coral rings and bracelets really pop. 8) Not Your Mother's Dry Shampoo, Walmart - $5: I've tried a lot...and I mean a lot of dry shampoos. Just because I have thick hair that looks flat all the time. This is the best one I've used in terms of the volume I can achieve in my hair from it. Wishing you all a wonderful week! What are some of your favorite items this July? Feel free to share in the comments below! !